Summary: The goal of this project is to design, produce, and distribute sea turtle life-history posters depicting the five species of sea turtles found in Florida waters. Each of the five posters will feature accurate biological illustrations of an individual species showing its life cycle, migrations, ecological relationships, threats, and conservation needs. Dawn Witherington has agreed to complete the poster illustrations and design. She is a highly-skilled artist and biological illustrator who specializes in coordination with experts to achieve anatomically accurate depictions of marine species, including sea turtles. 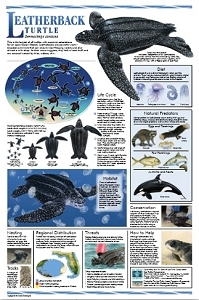 Succinct text will accompany illustrations within poster designs, which will be similar to conservation-education posters produced for other marine species (poster examples attached). Printed posters will be 24” x 36”, full (4) color, and on heavyweight stock. There will be 3,000 posters printed for each of the five species (15,000 total). Full poster sets will be distributed free to recipients including schools, non-profit environmental groups, museums, nature centers, and aquaria. Results: The printing and announcement of the availability of this project has been completed. All five versions of the posters have been printed and delivered to our offices. Initial promotion of the posters being available was through our e-newsletter (see attached) and an order form on our website (see attached image). A notice will also be sent out on the Florida Sea Turtle Permit Holder listserv. Requests for posters have begun to be fulfilled. Distribution has been primarily to teachers and government agencies (County, State and Federal offices) throughout Florida. Multiple sets of posters will be provided for distribution to the Barrier Island Center in Melbourne Beach. In addition, a full set will automatically be provided to Florida sea turtle rehabilitation facilities. Posters can be requested from STC.